A new analysis by the State Board of Education shows that achievement gaps exist in high-performing schools, low-performing ones and everything in-between. Last month, we reported that students of color are the majority in 65 of Washington’s 259 school districts. That’s a surprising figure for a state that is around 80 percent white, according to the 2015 census. 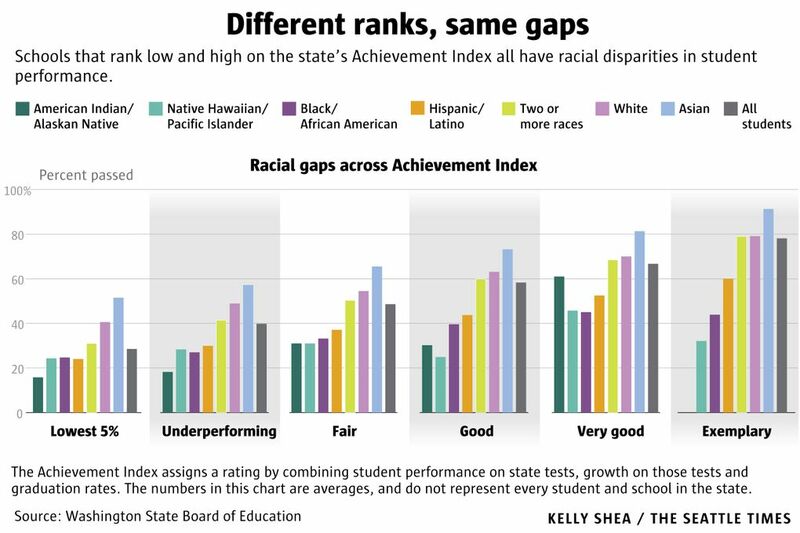 But even as the schools get more diverse, racial achievement gaps still remain a stark and significant reality. The State Board of Education’s annual report on Washington’s educational health includes a graph that shows those gaps. Even in high-performing public schools, black, Latino and Native American students, on average, lag behind their white and Asian-American classmates. To produce that chart, the Board used its Achievement Index — the way it ranks schools based on performance and improvement — to divide schools into categories ranging from low to exemplary. Then the board looked at the racial breakdown for the schools in each of those categories. The results showed that achievement gaps exist in high-scoring schools as well as low-scoring ones — making it clear that a high-scoring school isn’t a guarantee of success for all groups of students. In his K-12 budget proposal for 2017-2019, Governor Jay Inslee called for spending $866.8 million on programs to level the academic playing field. But not all the State Board’s numbers are bleak. In some areas, minority students are improving. A different chart in the same report shows that high school graduation rates are on the rise for students of color, with students who are learning English showing the most improvement with a gain of 5.4 percentage points. Or, you may notice that the Native American student category disappears in the “exemplary” schools section. This is because there weren’t enough Native American students enrolled to provide a reliable average, Parr explained. The chart also doesn’t weigh other factors, like the number of schools in each performance tier. The “good” category has close to 500 different schools, while “very good” has about half that number.